Wales forward Gareth Bale is "raring to go" before their Euro 2020 qualifying campaign, as he aims to put a testing season with Real Madrid aside. The 29-year-old's campaign has been affected by injury and criticism from fans and media in Spain. But Bale is fit and ready to spearhead Wales' attack against Slovakia at the Cardiff City Stadium on Sunday. "I've only had one injury. I've been fine. I have been playing. I've scored a decent amount of goals," he said. Bale, who played a leading role in Wales' run to the semi-finals of Euro 2016, added: "We want to be playing in the major tournaments and experience what we have been through. We need to produce again, we need to work hard as a team. "I am ready. I am raring to go." Bale has enjoyed great success since joining Real from Tottenham for £85m in 2013, winning four Champions Leagues and one La Liga title with the Spanish club. He has scored 14 goals in 35 club games this season but he has still been the subject of criticism, even getting jeered by a section of his own support during Real's defeat by Barcelona earlier this month. Bale seems happiest when he is on international duty, revered by fans as the nation's record scorer. He scored a free-kick during Wales' win over Slovakia in their opening match at the European Championship in France three years ago, the last meeting of the teams. And in preparation for Sunday's match against the same opponents - against whom Bale scored his first international goal in 2006 - Wales manager Ryan Giggs has been showing his players videos of the 2016 campaign. "It gives you those good memories of what we did and the hurdles we had to get over to qualify," said Bale. "It was a good thing to watch to refresh the mind on how to do it and show the youngsters what we went through. "It's two quite different teams at different times now. "It's great to have the experience that we did on that day, but we know it's going to be a difficult game tomorrow." Croatia are the top seeds in Wales' qualifying group and the World Cup runners-up, who started their campaign with victory over Azerbaijan on Thursday, are the bookmakers' favourites to win the group. 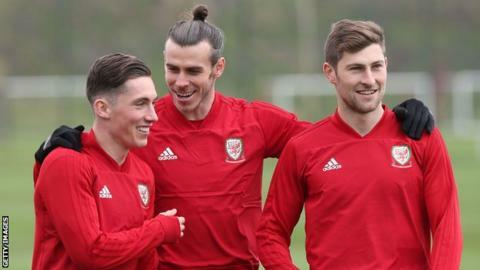 Wales are second seeds and Slovakia, who made a winning start against Hungary, are third - but Bale insists his side are aiming higher than the second qualifying place. "We are always the underdogs. The bookies aren't always right. We are going to go into this campaign looking to win the group. "We know both countries got off to a winning start the other day, but there is no reason why we can't."